This educational science and technology animation shows the concept of production, composition and setting of cement and all the chemical reactions involved in the processes; mortar and concrete are also touched upon. 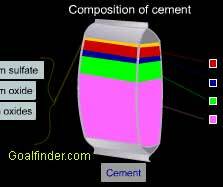 This is very useful for K9 -K12 students, teachers and for the industry people for understanding how cement works. What is the use of cement in life? What is Mortar and Concrete? Why calcium sulphate is added to the cement ? Why are cement and concrete used for construction ? it is mixed with water? The term cement is also commonly used to refer more specifically to powdered materials which develop strong adhesive qualities when combined with water. Cement is made by mixing substances containing lime, silica, alumina, and iron oxide and then heating the mixture until it almost fuses. Cement consists of particles containing compounds of calcium (Ca), iron (Fe), aluminium (Al), silicon (Si) and oxygen (O) in varying proportion. The main four raw material of cements are: 60% to 67% CaO, 17% to 25% SiO2, 3% to 8% Al2O3, up to 6% Fe2O3 and small amounts of magnesium oxide, magnesium sulfate, sodium and potassium oxides. During the heating process dicalcium and tricalcium silicate, tricalcium aluminate, and a solid solution containing iron are formed. Gypsum is later added to these products during a grinding process. Cement with a high aluminate content is used for fireproofing, because it is quick-setting and resistant to high temperatures; cement with a high sulfate content is used in complex castings, because it expands upon hardening, filling small spaces. Cement is usually mixed with other substance. Mortar is a mixture of cement, sand, water and lime. Concrete is a mixture of cement, sand and crushed stones. Ans: Improper curing of new concrete substrate (requires minimum of 7-28 days, temperature dependent). It could also fail due to bond-preventing compounds, form release agents. Failure could be due to embedded surface contaminants - oil, grease, adhesives, markings, paint, rust, and other barrier creating substances which prohibit adhesion. Another reason could be that in hot day with low humidity, it can cause the water inside samples facing higher evaporation through the diffusion mechanisms and weaken the samples. With samples under air and natural weather that faces evaporation due to the tropical weather causing insufficient water content for hydration process. Ans: Foam concrete is cement-bonded material manufactured by blending a very fluid cement paste (slurry) and then injecting stable, pre-formed foam into the slurry. The volume of slurry to foam dictates the density of the concrete. These are suitable for both precast and cast-in-place applications. Good strength characteristics with reduced weight make it suitable for structural applications such as lightweight partitions, wall and floor panels. Autoclaved Aerated concrete (AAC), is a lightweight, precast building material. It provides structure, insulation and fire resistance. AAC products include blocks, wall panels, floor and roof panels. It can be routed, sanded and cut to size on site using standard carbon tip band saws and drills. It has excellent thermal efficiency. Ans: Cement Kiln are a huge cylindrical furnace 12 to 25 feet in diameter and 450 to 1,000 feet in length. They are set on a slight incline and rotate from 1 to 4 RPM. Cement kilns can process up 200 tons of raw material such as limestone, clay, and sand each hour. Raw materials are introduced into one end of a kiln. The kiln is slightly elevated at the end where the materials are introduced. The materials move slowly toward the other end. As the raw materials tumble through the kiln, they are gradually heated to at least 2,700ºF. As they are heated, the molecules of fuel, air and raw materials break apart. When temperatures reach 2,700ºF. the molecules recombine to form a stable new mineral compound called "clinker", the primary ingredient found in Portland Cement. Ans: The operation of the cement production is described in the animation, please refer to it by either subscribing it and viewing it online or by purchasing and downloading it. Ans: Foamed concrete -Cellular Lightweight Concrete and AAC are equal in terms of easy workability, strength, non-toxic, pest & mold resistance, high thermal & acoustic insulation, durability and fire resistance, however CLC has lesser water penetration, can be used for low-rise load-bearing role as compared non load bearing use of AAC, can be cast in place economically, gains strength with age and can also be made from fly ash, can also be pumped for filling up gaps, produced with low energy need. Ans: Burn ability reduces as LSF increases or free lime increases. C3S/C2S are controlled by LSF, excessive free lime results in increased autoclave expansion and unsoundness during setting or losses in strength, higher LSF mixes are more difficult to combine than are lower LSF mixes. Coarse feed is harder to burn. It can also lead to decrease in clinker grind ability. Ans: Hurriclon reduces the pressure drop by up to 50% and high de-dusting efficiency. The particles are pushed by centrifugal force into separating chamber. The gas flow exit by its unique double submerged pipes (double dip tubes) makes it highly efficient. It has a separation efficiency of up to 98%. Multicyclone has a number of small cyclones. The flue gas passes thru the small cyclones with great peripheral speed, thereby separating the particles from the flue gas. It has around 90% efficiency. 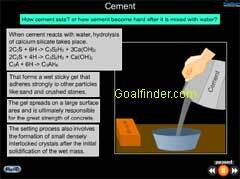 Ans: Cement does not set by drying but through chemical reactions between the its grains and water. Concrete’s setting, strength gain, and durability all depend upon the setting processes. The following properties of concrete are affected by cement processes – water requirement, admixture incompatibility, chloride permeability, sulfate resistivity, workability, heat of hydration, setting time, shrinkage, strength, slump loss etc. Ans: Presently ASTM C869-91 (2006) is the standard specification for foaming Agents used in making preformed foam for cellular concrete; this supersedes C869-91 (1999), approach astm.org for the details. Generally, foaming agents are characterized by the Size of foam bubbles, Stability of foam, amount of foam produced per kg of foaming agent. The effect of foaming agent is also measured by air content, compressive strength, tensile splitting strength, density, and water absorption of concrete. Ans: DUCRETE or depleted uranium concrete is formed of depleted uranium aggregate DUAGG containing depleted uranium dioxide (DUO2) sintered with a synthetic-basalt-based binder. This concrete replaces the Portland cement, sand, and water for use in normal concrete. The synthetic-basalt-based binder coats the sintered DUO2 particles and retards their surface reactions. DUAGG composition has Al,Cu.Fe,K,Mg,Si,Sr,Zr,Ti in small % by weight with around 94% depleted Uranium. Ans: If you want general references (like we sourced) Internet and other online sources have number of these available, for exact specifications and details contact the standards authorities or the countries themselves. Ans: High-alumina cement is a rapid-hardening cement, has a high resistance to chemical attack but generally their compounds act in combination : high (50-60%) C3S and C4AF have high sulfate resistance and used in foundations, high C2S (50-55%) and low C3S (20-25%) has low heat of hydration and used in massive structures such as dams. Ans: Aerated Autoclaved Concrete (AAC) cellular or porous concrete is an economical, lightweight, structural material that provides thermal and acoustic insulation. It’s blocks be easily cut to size on the site. Prepared from Portland cement, lime, silica sand, water, and aluminum powder. Hydrogen bubbles out creating 1/8 inch holes filled with air hence is called Aerated. This solution is autoclaved (heated in high pressure vessel at 12 bar at 190 deg C) to for further reactions and hardening.